The Dynamic IP Restrictions (DIPR) module for IIS 7.0 and above provides protection against denial of service and brute force attacks on web servers and web sites. To provide this protection, the module temporarily blocks IP addresses of HTTP clients that make an unusually high number of concurrent requests or that make a large number of requests over small period of time. Blocking of IP addresses based on number of concurrent requests - If an HTTP client exceeds the number of concurrent requests allowed, that client's IP address gets temporarily blocked. Blocking of IP address based on number of requests over a period of time - If an HTTP client exceeds the number of requests made over a specified time interval, that client's IP address gets temporarily blocked. Allow list of IP addresses that will not be blocked - You can add a list of the IP addresses of clients you want to exclude from being blocked by the module regardless of other configuration. 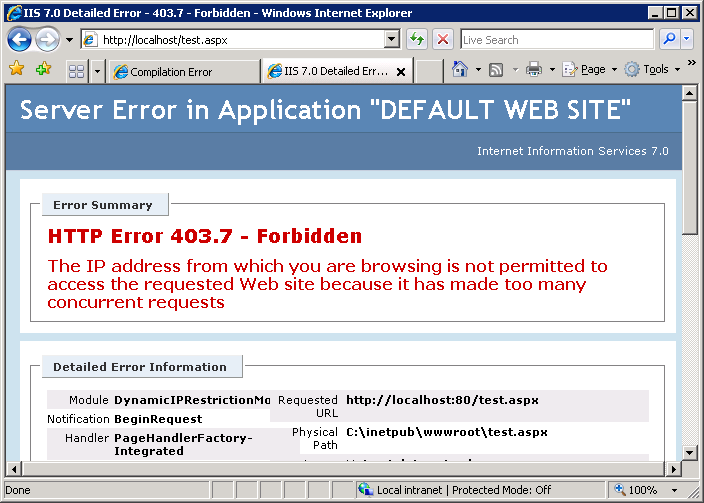 Various deny actions - You can specify which response to return to an HTTP client for which the IP address is blocked. The module can return status codes 403 and 404 or just terminate the HTTP connection and not return any response. 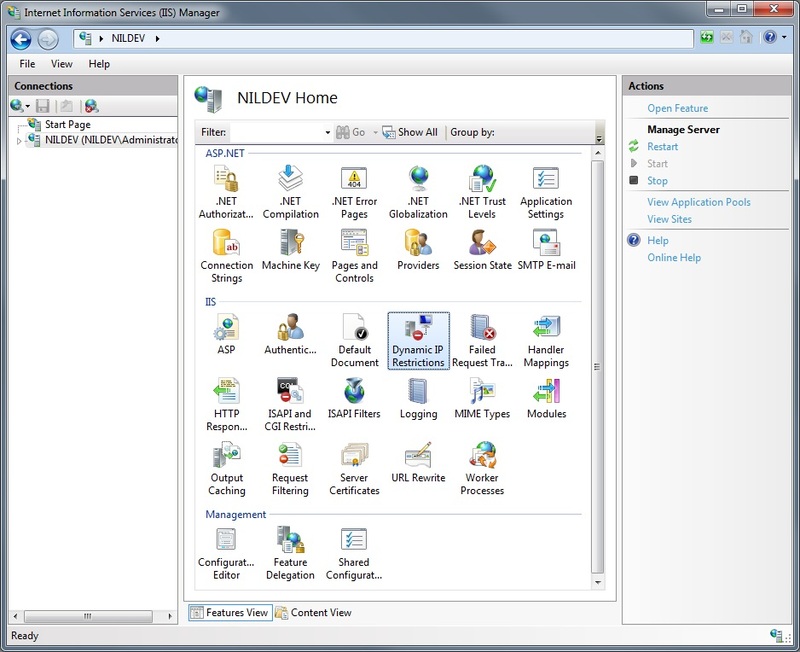 Support for web servers behind a proxy - If your web server is behind a proxy, you can configure the module to use the client IP address from an X-Forwarded-For header. IPv6 - the module provides full support for IPv6 addresses. You can use the Web Platform Installer (Web PI) to install the Dynamic IP Restrictions module, or you can download it from the download page. You must have one of the following operating systems. If you are using the first Beta release of the DIPR module, you must uninstall it before you install the Release Candidate, or an error will occur and the installation will fail. Make sure you back up your configuration before uninstalling the Beta version. If you are using the Beta 2 release of the DIPR module you can upgrade directly to the final release. Your configuration settings will be preserved. The Dynamic IP Restrictions can be configured by using either IIS Manager, IIS configuration APIs or by using command line tool appcmd. In the left-hand side tree view select server node if you want to configure server-wide settings, or select a site node to configure site-specific settings. In the Features View click "Dynamic IP Restrictions"
Selecting the "Show Allowed Addresses" link above will bring up a window as shown below where you can see all the IP addresses that are allowed to bypass Dynamic IP Restriction validation. You can add more IP addresses to the list by selecting the "Add Allow Entry" link on the right. When using this option, the server will allow any client's IP address to make only a configurable number of concurrent requests. Any additional requests that exceed the specified limit will be denied. When configuring number of concurrent requests for a real web application, thoroughly test the limit that you pick to ensure that valid HTTP clients do not get blocked. This is especially important for Rich Internet Applications that have AJAX enabled web pages and serve media content. When using this option the server will deny requests from any HTTP client's IP address that makes more than configurable number of requests over a period of time. 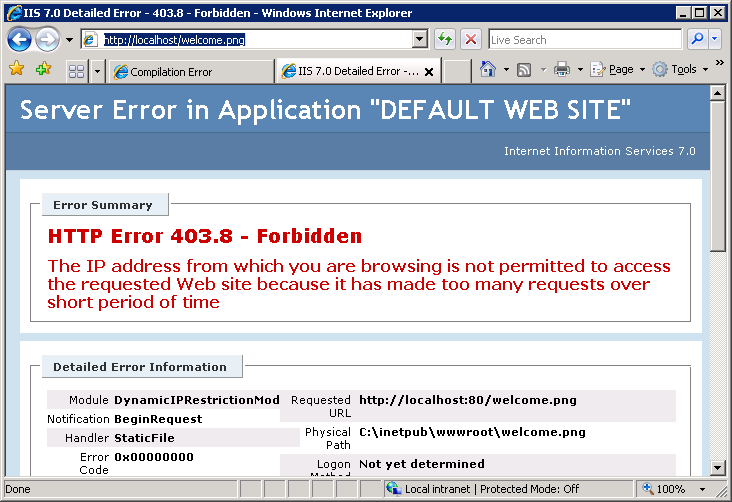 The IP address will remain blocked until the number of requests within a time period drops below the configured limit. If you wait for another 5 seconds when all the previous requests have executed and then make a request, the request will succeed. When configuring number of allowed requests over time for a real web application, thoroughly test the limits that you pick to ensure that valid HTTP clients do not get blocked. This is especially important for Rich Internet Applications that have AJAX enabled web pages and serve media content. Abort request by closing the HTTP connection, without sending any response to the client. If your web servers are behind a firewall or proxy machine, then the client IP for all requests might show up as the IP of the proxy or firewall server. 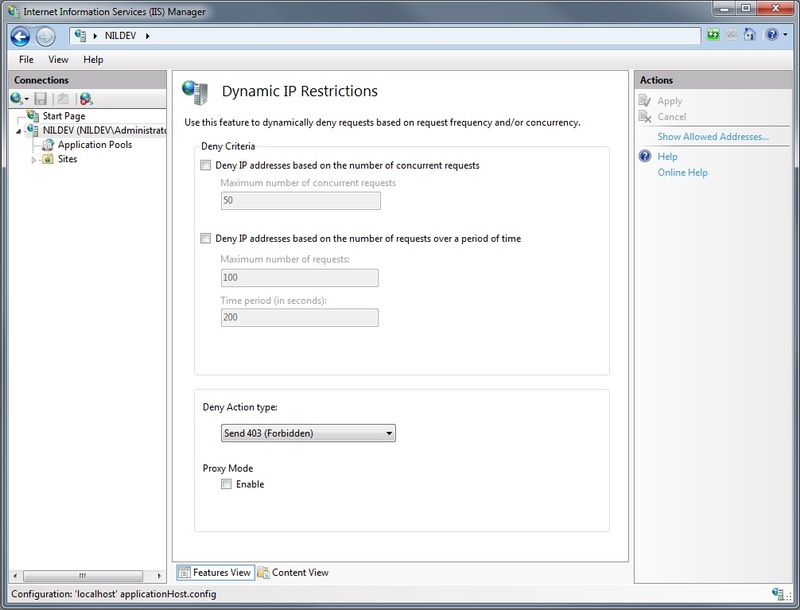 This would hamper the ability for Dynamic IP Restriction module to be useful. Most of such servers however add an X-Forwarded-For header in the HTTP request that contains the original client's IP address. Selecting the "Proxy" mode checkbox in the main Dynamic IP Restrictions configuration page will check for client IP address in this header first.